Expos Manager Buck Rodgers liked what he saw in Billy Moore. 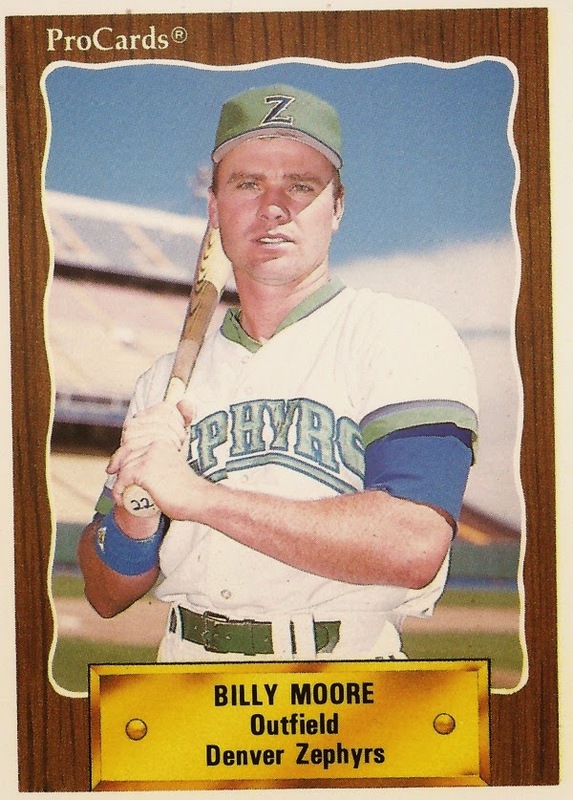 Moore had done well in the minors for some time and this call-up in July 1986 was Moore's first, helping replace injured rookie Andres Galarraga. "He gives you a good effort with men on base," Rodgers told The Montreal Gazette after the call-up. "He doesn't take those little safety-first swings, he wants to drive the ball somewhere. I always like to see that kind of inherent aggressiveness." Moore ended up getting into six games for the Expos that summer, getting two hits in 12 at bats. By July's end, he was sent back down to AAA. He played for five more seasons. But he wouldn't make it back to the majors. Moore's career began in 1983, taken by the Expos in the sixth round out of Cal State Fullerton. He played his first season at rookie league Calgary, hitting .362 in 59 games. The next year, he played at single-A West Palm Beach, hitting .300 and and 22 home runs. One of his home runs came in a mid-April win. He hit a game-winning single in an early May game. He also earned a short taste of AA Jacksonville. Starting that year, Moore talked to The Palm Beach Post about what it took to get him to that point. And, with a college cooking accident, it was a lot. Cooking two years earlier, Moore almost lost a finger when he sliced into it, severing tendons. After therapy and some set-backs, Moore got back to form. "Every swing I was afraid it would pop again," Moore told The Post. "It took a while before I got used to it." Moore continued hitting in 1985 at Jacksonville. While his average dipped to .259, his power increased with 33 home runs. By that point, Montreal had its eye on Moore and a couple other minor leaguers, including Mike Hocutt. Moore and Hocutt's minor league careers had mirrored each other, hitting for power and playing on the same teams as they developed. It's something The Gazette noted after Moore's call-up in July 1986. "They've been our dynamic duo for three years," Expos farm director Bob Gebhard told The Gazette. "Moore is a little more of a long-ball threat but they are considered equal in potential." Hocutt, however, ended with exactly six fewer major league games than Moore. Returning to the minors for 1987, Moore's average dropped to .249. His power also dropped, with 12 home runs. His last full season with the Expos system was 1988, hitting .285 with 17 home runs. But Moore was still considered a prospect. As the Braves shopped Rick Mahler in August, Atlanta wanted a top prospect in return. Moore was one name mentioned. A young Randy Johnson was another. The deal never got done. Moore did move the next year, to Baltimore's system and AAA Rochester. Moore welcomed the move, according to The Los Angeles Times. "You get to a point in your career where something has got to change, you either need to be traded or have more of an opportunity to play in the big leagues," Moore told The Times. "That long with one organization, they have pretty much made up their mind about you and pretty much dwell on what you can't do instead of what you can." Moore, however, hit just .199 the rest of the way with Rochester. He signed with the Brewers for 1990, playing the year at AAA Denver. He hit .288 with 18 home runs. He played just 37 games the next year with the Rangers at AAA Oklahoma City. He hit .220, finishing out his career.